FreeBSD did not load after you tweaked something? Here’s how to fix it. Sometimes we do some modification that breaks the system boot. 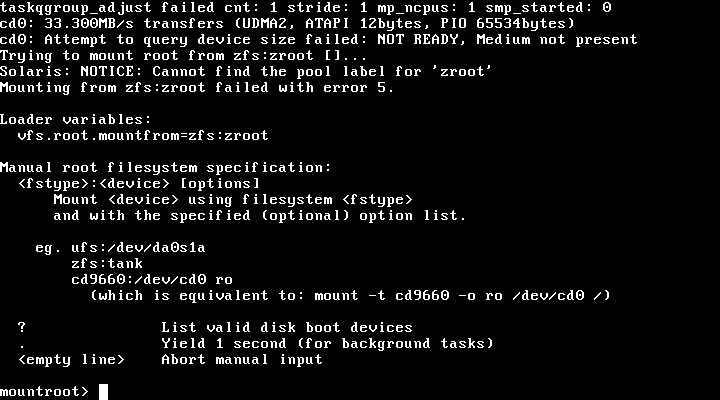 The mountroot error is some problem to mount the disk, usually something that has been changed in fstab or loader.conf. Boot with the image and then choose the Shell option in the dialog. It is necessary to know which disk partition you have to mount so you can use the command sade and then run the command below changing to your disk. Check your fstab for what is wrong and then reboot. For more details check: Handbook.